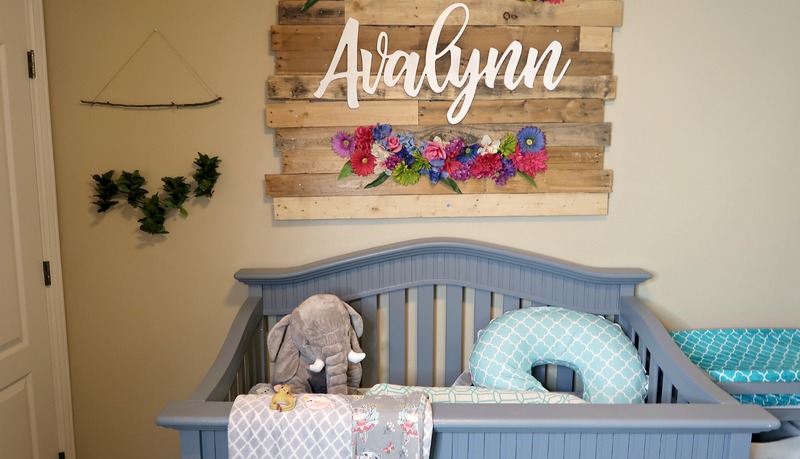 I was waiting until the nursery was totally finished before I shared everything…… but….we moved, so here is Avalynn’s unfinished nursery tour. I would say we got about 75% finished with everything. Check out the video below for more! *You may have already seen her video in this post, but if you haven’t, check it out! Since we were renting, we weren’t able to paint the walls. I would have chosen a light grey color. We did try to bring some pops of colors into the room through the decor. My favorite item in her room was her sign that we made for her! I love how it turned out so much! I also made her a headband board and since she is our only baby girl, this mama went a little crazy with the headbands in EVERY color….just in case. I have no regrets! It was fun and easy to make- you can see how I did it over here. I decided to not go with a theme for her nursery but just find cute things that were mint, teal, and purple. We loved grey as well. I felt like her nursery was a very happy room and would have been amazing if we had been able to finish it the way we planned! Her furniture was curated from several sources. The crib used to be her brothers’. Both Andrew and Aidan used it- it was white then. I thought it was kind of special for all of our babies to use the same crib so we kept it. We wanted to change the color to grey so my husband refinished and repainted it. Then, I found this changing table that was the exact same color grey. I loved having the built in laundry bin and drawers for diapers, wipes, and burp cloths. We also LOVE our Dekor diaper pail. It’s so nice having a diaper pail that is hands-free and you don’t have to touch anything. I have a review coming very soon to show you guys how it works and how to replace the refill bags. It’s so easy and I highly recommend it! On the opposite wall is her dresser that was mine when I was a baby. We had plans to also refinish it and repaint it grey to match the rest. I even ordered some pretty new hardware (you can see it in the video above) from Etsy, but we will have to wait a bit longer than I had planned. I can’t wait to see it once it’s finished someday. On each side of her dresser are two white bookshelves that we brought with us from her grandparents in Florida. We had planned to just freshen them up with another coat of paint but keep them white. I love the grey/white combination. It was so nice to have all of the storage in her room to help keep things organized like her Freshly Picked baby moccasins and the baby blankets that belonged to Drew and I when we were babies. Her closet was just used for clothes. I had all of her outfits organized by size with dividers that made it much easier each day. I kept her leggings in a bin on the shelf along with a bin of accessories and in the center bin, I’d move anything she outgrew so I could decide whether to save it or donate it. It’s so crazy to think we started out with NO baby girl clothes (after having two boys) and quickly ended up with all of these cute things! Thanks to her Aunties and grandparents who had as much fun shopping for her as I did! On her dresser was a basket filled with blankets and swaddles and some bears from my childhood. I also had a stack of baby-related books and her lamp with one of those cool color-changing smart lightbulbs that we would change to pink or blue during the night. It was really convenient being able to dim the light and change color from my phone. It made it easier to see during night changes and feedings without having to wake her up with the big light. We also used Amazon Echo Dot in her nursery to stream lullabye music all night. I loved that it was commercial free! Aside from her name sign, we had a few other pieces of artwork in her room. The “Sweet Baby Girl” sign is from Hobby Lobby. Her name art was made by her Auntie Alexa (the boys have one also)! And we had a few extra prints that weren’t hung up yet that were going to be part of a gallery wall in the corner where her changing table was. In front of her window was a big, wide toy box I got for her from At Home. I loved the mint color and I loved that it was low so that she could reach in when she started to stand up all by herself. Next to that was her favorite Rockabye Owl rocker she LOVED. At the time of filming this, Avalynn was still not yet sleeping in her crib, which is why we kept some of her things inside it: DockAtot, big elephant plush, Boppy, Slumber Sloth, etc. She slept in her Fisher Price Rock-N-Play Auto rocker. Also….. I filmed this video the night before we started packing up the house to move (which is why some of her bookcase shelves had piles of clothing and some of her bins were empty). This home will always have a special place in our hearts and I’m glad I was able to document some of it so our kids will get to look back someday and see part of their childhood. Thanks so much for coming along on an unofficial tour of Avalynn’s Nursery!